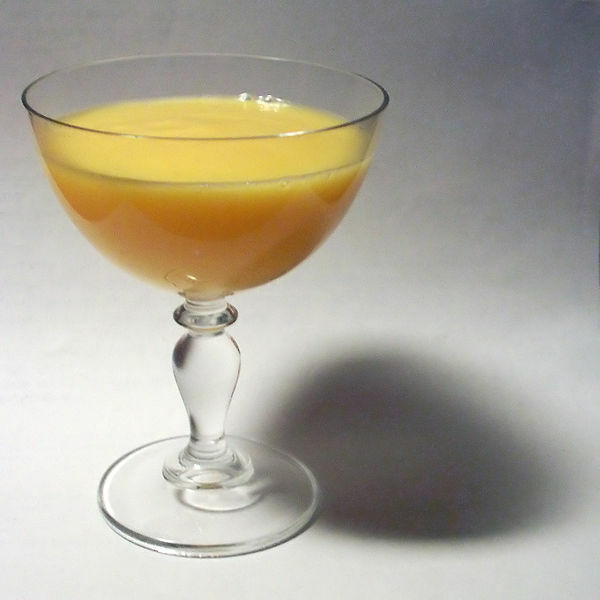 Advocaat (or advokat) is a rich and creamy liqueur made from eggs, sugar and brandy. It has a smooth, custard-like flavor. In English-speaking countries it generally contains 15% alcohol (30 proof), but in Continental Europe the typical alcohol content differs from country to country and is generally somewhere between 14% and 20% ABV. Its contents may be a blend of egg yolks, aromatic spirits, sugar or honey, brandy, vanilla and sometimes cream (or evaporated milk). Notable makers of advocaat include Warners, Bols, Dwersteg (first organic advocaat), Verpoorten, Warninks, Cooymans, Jansen and De Kuyper. The original advocaat was a liquor made by the Dutch population of Suriname and Recife with avocados. Upon returning to the Netherlands, where avocados were not available, a similar texture was achieved with thickened egg yolk. In the export variety only the pure egg yolks are used, making it particularly well suited for cocktails and long drinks. The best known cocktail using advocaat is the Snowball: a mixture of advocaat, sparkling lemonade and sometimes lime juice, although this is not required for the drink. Another highly popular advocaat-based beverage is the Bombardino, a drink commonly found in Italian skiing settings, made by mixing advocaat, black coffee, and whiskey (see the recipe below). Bombardino is a drink popular in Italy during the Winter, especially in the ski resorts. It is made by mixing 1/2 Advocaat or eggnog and 1/2 Brandy. Its name is supposedly derived from one of its first imbibers noting its hot temperature and high alcohol and remarking (in Italian) "It's like a bomb!". Now they add caffeine power drinks. It is served hot in an Irish coffee mug and with whipped cream on top. It has several variations: with coffee (calimero), with rum (pirata) or whiskey (scozzese).